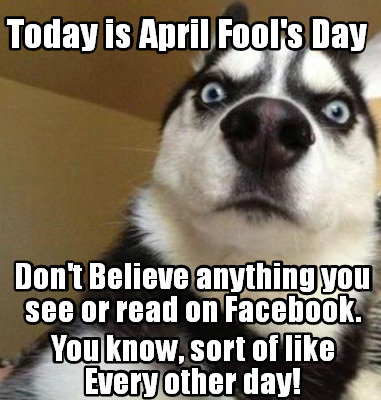 I don’t think I’ve actually celebrated April Fools’ Day in…like a long time, but this meme made me laugh because…truth. So, in summation…there was a week. I did stuff, listened to stuff, read stuff, watched stuff, and wrote stuff. That is all. So, writing. I actually did some. In fact, I finally got my $h!t together, got the first chapter and some plot points figured out on Cooper’s book and sent it all off to NYC. Mr. Ed liked the changes and the direction and I now have a go to proceed with the whole book, deadline in June, release early in 2020. I’m going to knock it out and then get back on track with my other series, though maybe, if I get all inspired, I can work simultaneously. Anyway, it feels like that light at the end of the tunnel isn’t a train. Reading: I made it through book #6.5 in the Black Dagger Brotherhood series before sidetracking. Book 7 is on hold at the library, another book I had on hold dropped–which I polished off today because it was short–and now I’m going to re-listen to book 1 in a spin-off series in Shelly Laurenston’s shifter world. The honey badgers and bears are always a treat. The second book is out but I want to refresh my memory as to the events and characters, plus I laugh out loud. For readers looking for a paranormal romance series with lots of species, AND humor, I can recommend Laurenston’s The Pride Series. The world starts with THE MANE EVENT. I’ve laughed through all of these books but there’s also sweet romance and lots of action. Sports: I ❤ Spring! Baseball! Softball! And did I mention BASEBALL?!?! My Cards played the Brewers and came out of the series 1-3. Ah well. There were lots of homeruns and some great plays but the Brewers are expected to win the NL Central so… My OSU Cowboys are playing some good baseball. Theyr'e 17-8 on the season, and have some votes to bust the top 25. My Cowgirls are ranked! Their place depends on which poll but hey! They're ranked and playing awesome ball. They went 2-1 in the three-game series against Texas (higher ranked), including one game where they run-ruled the Longhorns. OU is ranked #2. They're always hot. If OSU and OU both make it into the Women's College World Series, there would be sell-out crowds! Not holding my breath but it would be fun to watch. Let's see. What else? I did some updating on the website, getting up-do-date info there, especially on the book list page. I'd love to be in a position to hire somebody to do all the "maintenance/social media" stuff for me. 😆 Then I could just be a hermit in my writer's cave. On that note, I have words to write, coffee drink, and a Monday to face. That fact that it's Monday is enough of an April Fools' joke. What about y'all? Do you like April Fools' or wish it would die a natural death? Do you play pranks? What are you reading/watching/writing? How's your world? Have a great week. This entry was posted in Writing Life and tagged books, coffee, follow up, fun stuff, holiday, Monday, procrastination, reading, Red Dirt Royalty, series, sports, stuff, TV, WIPs, writing. Bookmark the permalink. First off, YAY for WRITING! You sound so much happier this week. =o) Always yay for Live PD. I’m glad they’re back in Greene County – even if the people there make me cringe. Better the devil you know, eh? Yay for baseball, too! The Yankees ended up about where the Cards are – 1 out of 3. Stoopnagles. I’m reading a brand new, ‘hot off the e-presses’ suspense that I would’ve been drooling over had I known it was coming out before it released. So far, so awesome. I also finished a gripping British suspense. I’m not writing anything, but the editing drought should be done with as of today. New month, new attempt at gumption. Life is good. Spring is in the air. And all that shitstuff. 😉 Glad you found some good books to read. And yay for edit-y stuffs!